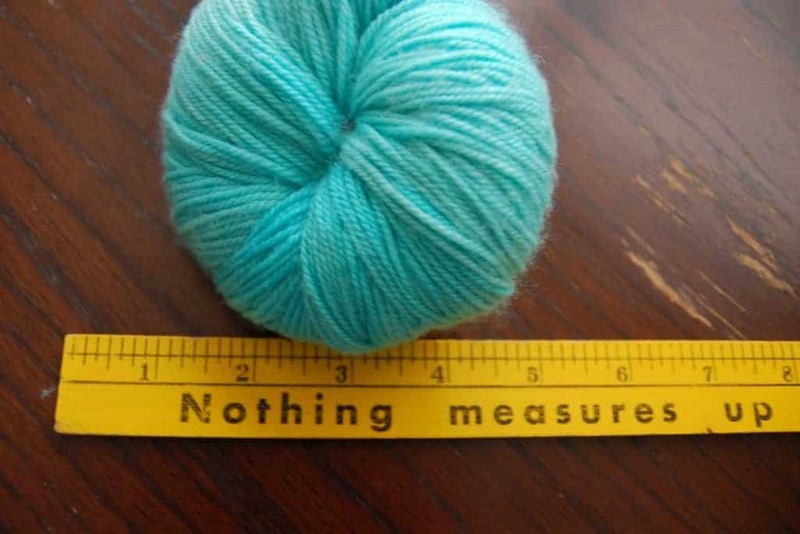 I’m sure many of you spent your Memorial Day weekend away, or knitting (hopefully both). I spent this past Sunday afternoon doing a little — wait for it — spinning. Well, let me backtrack a bit. My friend Anne, the owner of Middle Brook Fiber Works (formerly A Little Teapot Designs) invited me out to her sprawling property in rural New Jersey to observe a fiber retreat and gather material for a blog post and a possible longer story. 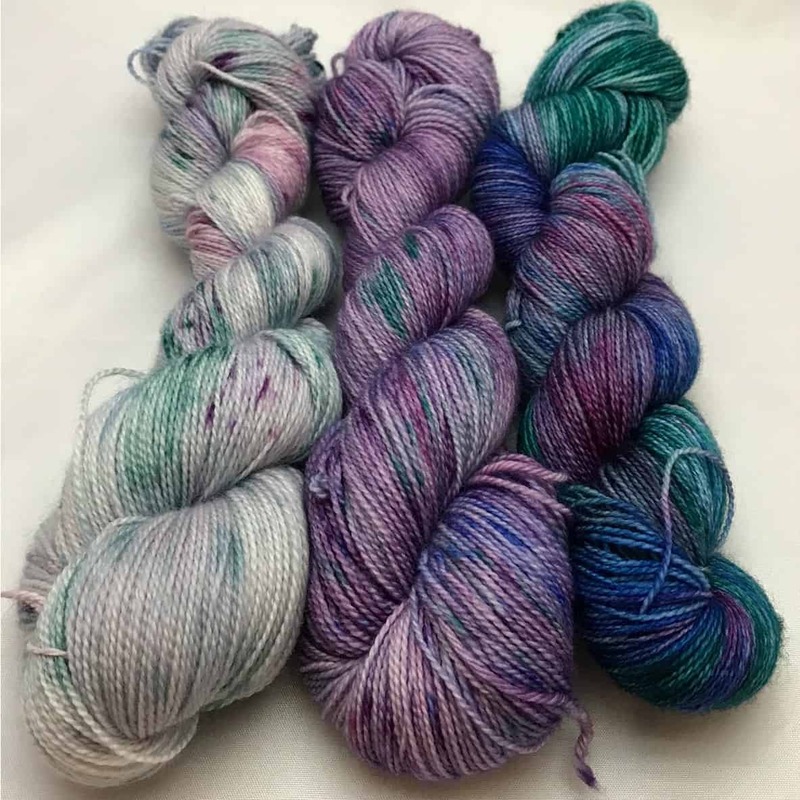 I wasn’t able to attend her first event, on May 14 and 15, but I did end up coming out for the day last weekend to get a peek at the process of creating art yarn. 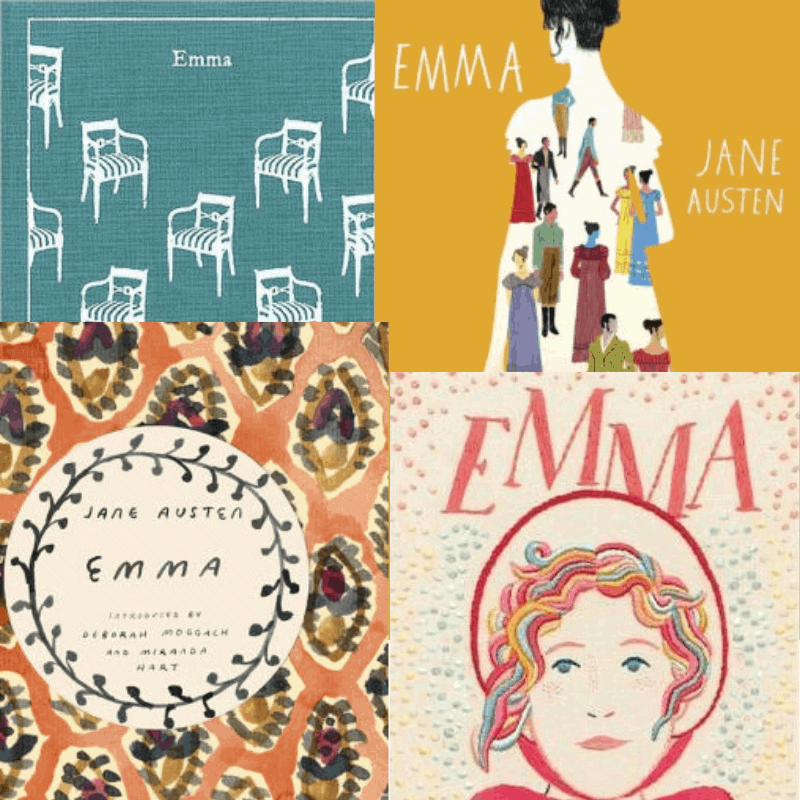 Before I met Anne, the term “art yarn” gave me visions of fun fur and feathers. 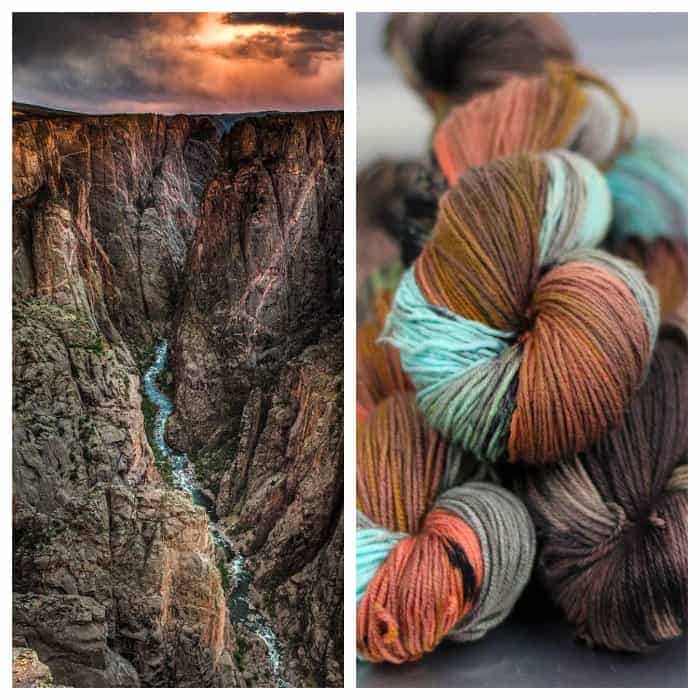 Ideally, combining those two words, to me, meant a complex hand-dyed semisolid or variegated colorway, preferably on some combination of Merino, Cashmere or silk. As for spinning, I’ve always been keen to learn, but was cautious about taking up a hobby that would cut into my knitting time and add to the stash I try in vain to cut down (because that’s what we do). 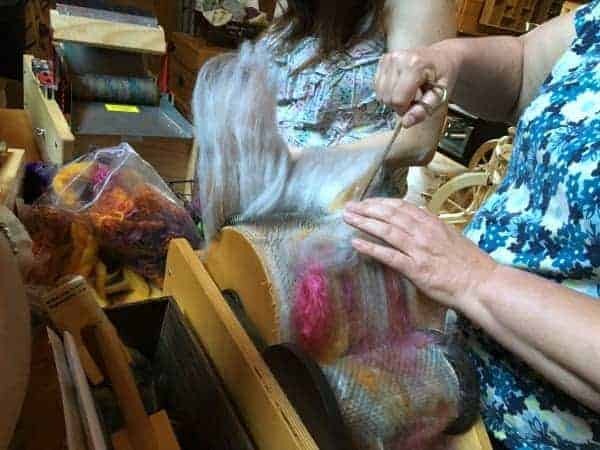 But, leave it to Anne, and the two talented fiber business owners she invited over — Laura Spinner of Rainbow Twist Fibers and Ginny Tullock of Fat Cat Knits — to change my perspective. Feeding the mixture into the drum carder. The afternoon started off with a delicious lunch of kimbap, or Korean sushi that we hand rolled ourselves in the dining area of the gorgeous converted barn on Anne’s property. The meal was a bit of foreshadowing for what was to come. After we ate, the group moved over to the other side of the barn, where Anne had set out a few drum carders. 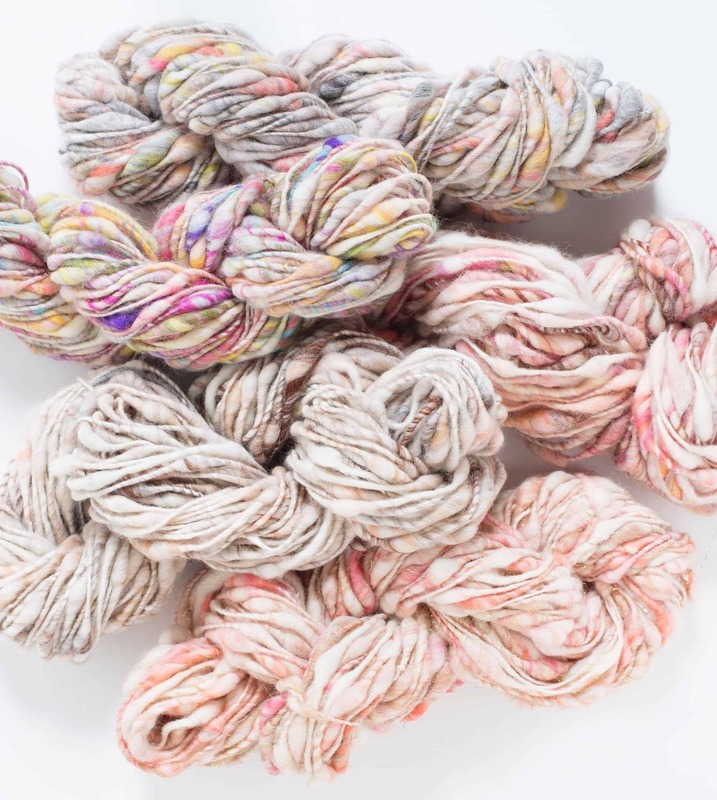 The trio set to work, with Anne blending a colorful combination of hand-dyed, combed organic Polwarth and Falkland Merino top, kid mohair locks, silk sari fiber, silk roving and sparkle (pictured in the top photo). Ginny of Fat Cat Knits removing her batt from the drum carder. 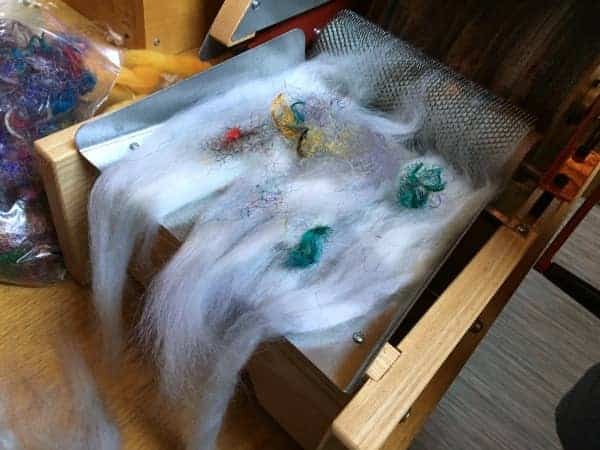 After the mixture was fed through the drums, the combs pulled it all together into fluffy batts that were ready for spinning. I then watched as Laura and Ginny got to work at two of the several wheels that had been set up in the studio. 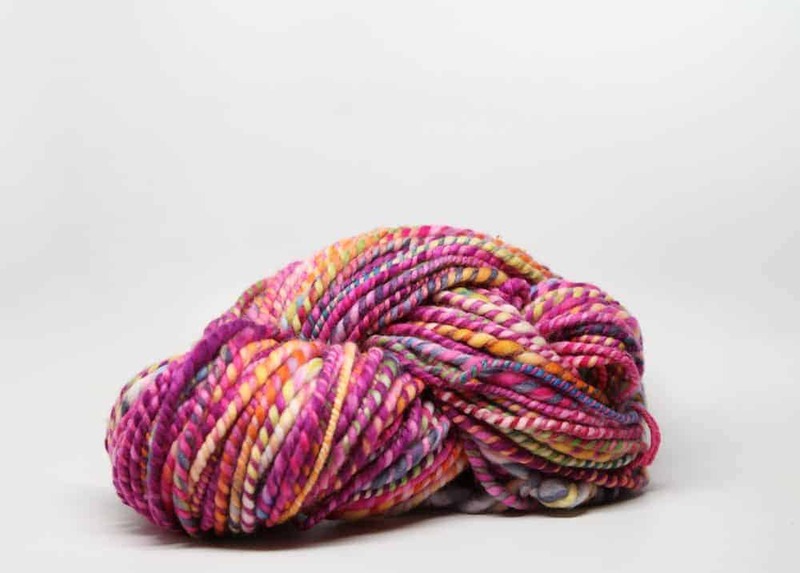 Slowly but surely, Laura and Gunny transformed the batts into unique, vibrantly colored skeins. 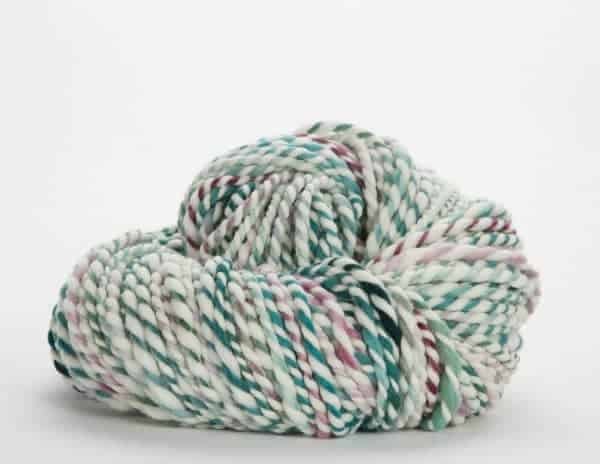 This was the kind of yarn you could easily wear around your neck, no knitting required. 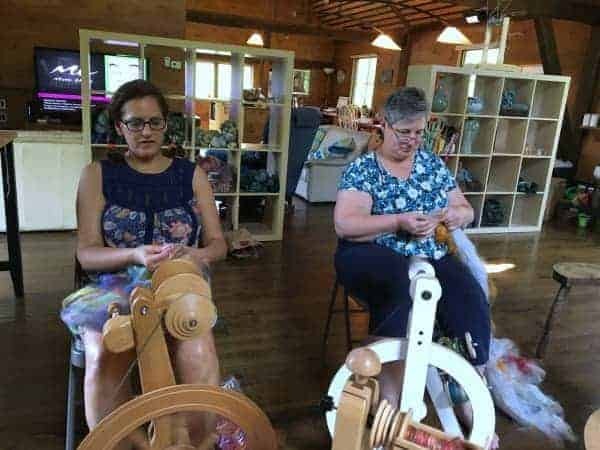 From left to right, Laura Spinner and Ginny Tullock, at work on the wheels. While the spinning was going on, a couple of visitors popped by the studio and got quick beginner lessons from Anne at two of the other wheels. While she provided instruction, I set myself up at the Schacht Sidekick (a very compact, foldable wheel that Anne considers ideal for city folk like me) and practiced my treadling. After spinning some imaginary yarn for a while, Anne set me up with some Polwarth fiber. It took a little while to get the hang of drafting in just the right way without constantly tearing the fiber, and I took a stab at joining the yarn myself after spinning on my own for a bit. Not the prettiest, most consistent handspun. But mine. I think working on my treadling helped me get used it before I had my feet and hands doing two things at once. By the time Anne took a photo to immortalize the moment on social media, I actually looked like I knew what I was doing! I think I might wait a little while before going all (sp)in (at the very least until my husband and I settle in to our new apartment), but I enjoyed the opportunity to try it out for a bit longer than the quick demo I’d had at fiber events. 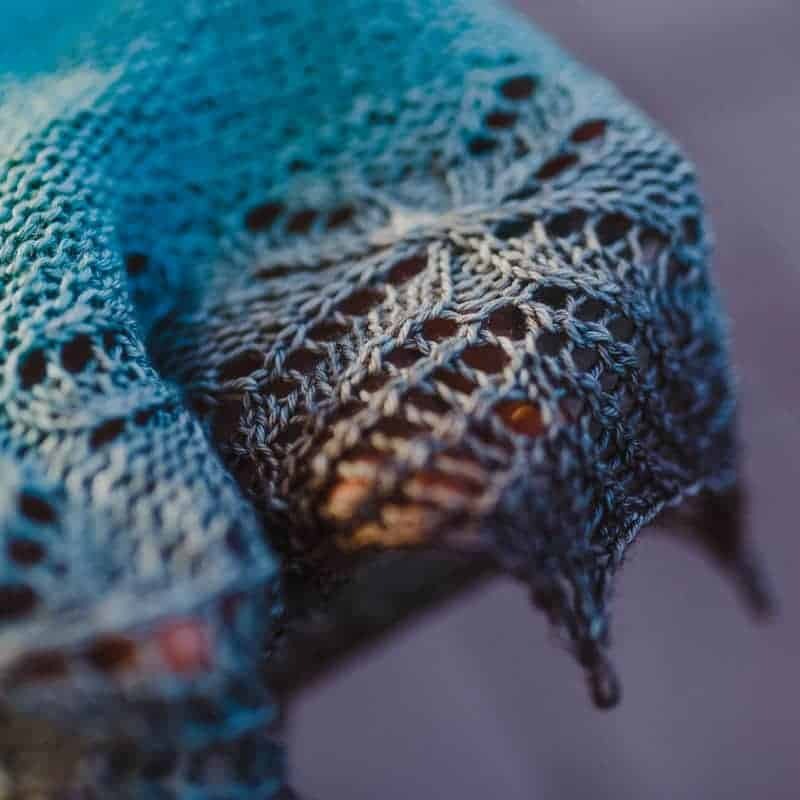 Knitting, and especially designing, can certainly be considered a kind of art, but the process of creating the yarn itself, and learning how different fibers work together, feels a little more expressive. 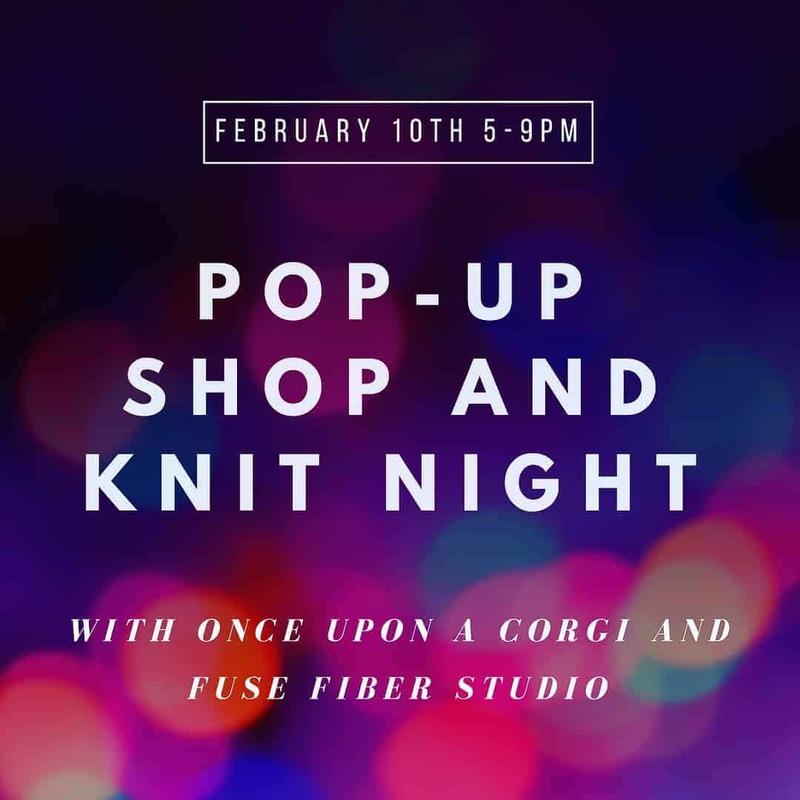 Anne is looking into organizing more similar open studio events and I look forward to continue my exploration of fiber. Lexi Parisse has been on a bit of a journey since starting her career in the NYC fashion industry years ago. 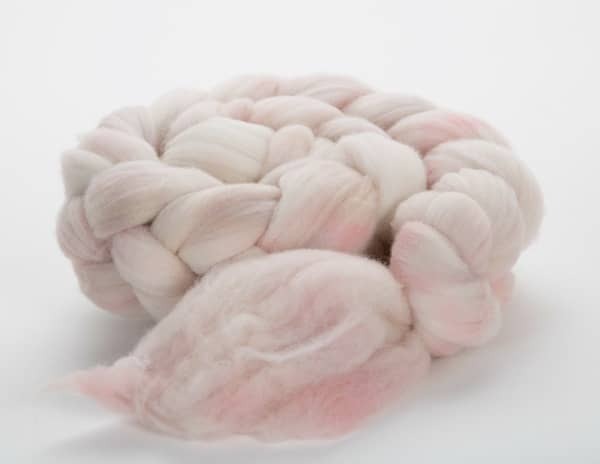 While working as a design and sales consultant for knitting machine manufacturer Shima Seiki, Lexi took a drop spindle class and fell in love with the more hands-on process — enough to leave her job and go to work on a Long Island, N.Y., fiber farm. 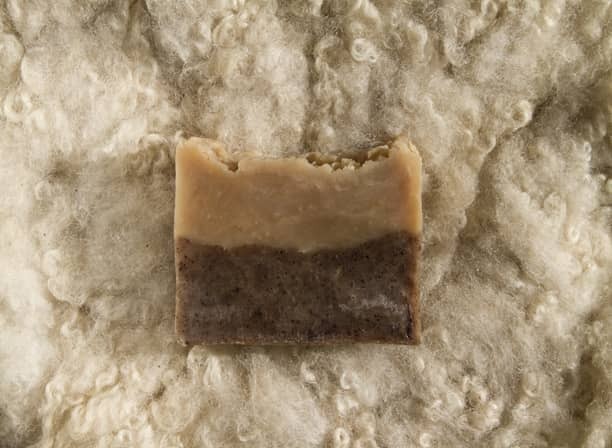 After becoming fully immersed in the world of sheep and wool, Lexi started up Queen Bee Fibers, selling hand-dyed fiber, drop spindle kits, handspun yarn and also bath, beauty and home products made with beeswax and honey from hives she and her husband keep outside of their home in Hoboken, N.J. These products are sold at several Whole Foods stores in the New York-New Jersey area, as well as on her website. Lexi is definitely dedicated to her craft, and a few weeks ago she traveled to Canada for the first level of a six-year Master Spinner course taught through Olds College in Alberta. 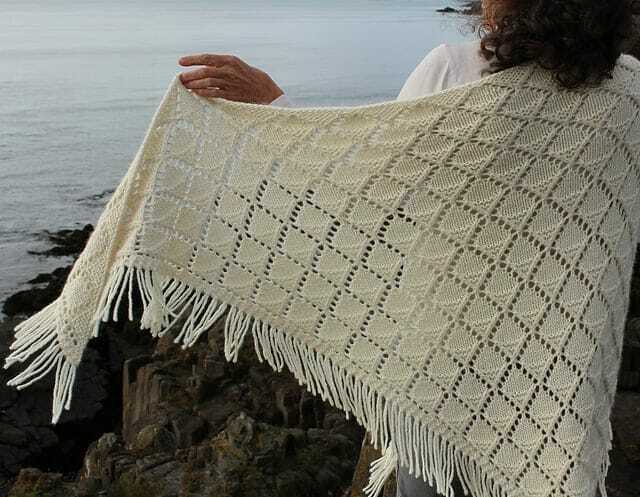 I first met Lexi last year at the Kings County Fiber Festival in Brooklyn, and was so happy to rediscover her recently when she invited me to join her Ravelry group, and so I asked her to expand on her interesting story. Tell me about how you learned to knit. I studied Knitwear design for my bachelors at FIT. We did not learn how to hand knit but we did learn how to program and use knitting machines because that’s whats used in the fashion industry. I wanted to knit a pair of leg warmers for one of my projects, so I watched a ton of YouTube videos and taught myself how to hand-knit. 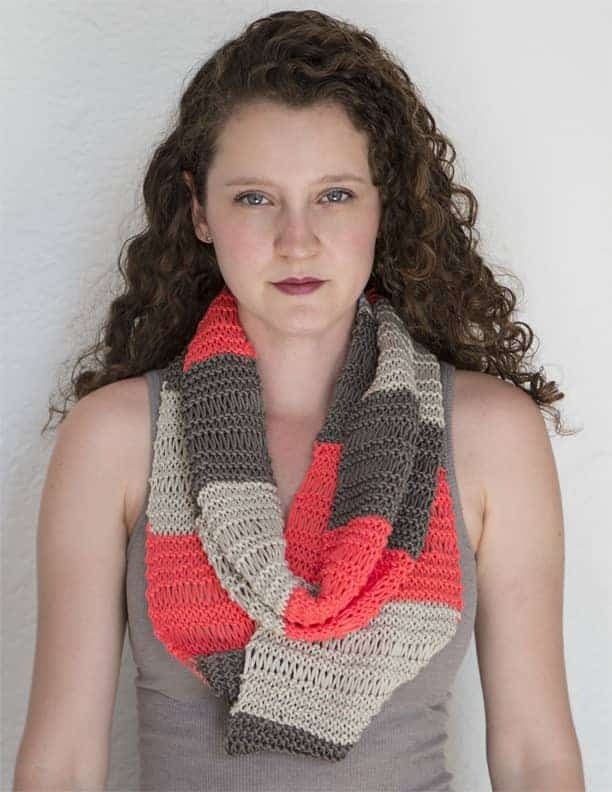 I knitted very simple designs for a couple of years and then dove into following patterns. I was addicted from the very first stitch and have not put the yarn down since. 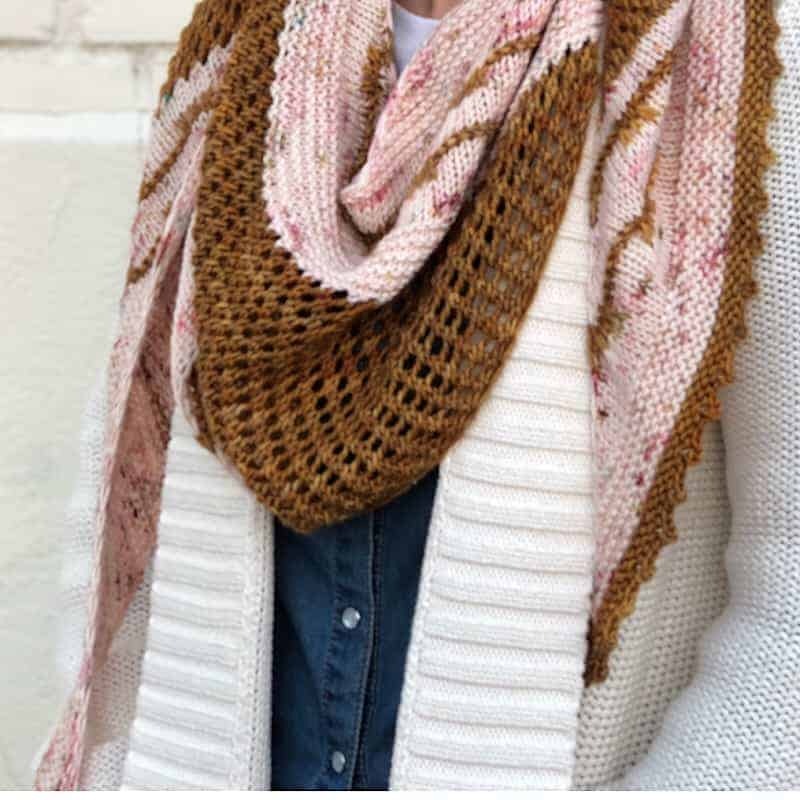 What were your responsibilities at Shima Seiki and how did your background as a knitter come in handy? Shima Seiki is the largest knitting machine manufacture in the world. My job was to be the liaison between the designers and the NJ factory. The machines in NJ were not just normal knitting machines, they were called WholeGarment machines; meaning the garment came off the machine in one piece. Designing for the machine could sometimes be challenging, so knowing how it ran and how to program a machine came in handy. I would help the designers design for the technology so the factory technicians would be able to knit it. I also would design inspiration garments for the showroom. What made you decided to leave your fashion job to work on a farm? What were your daily responsibilities there? I call this choice my quarter-life crisis and one of the best decisions I ever made. I had a wonderful job at Shima Seiki but the industry was just not my cup of tea. I had the opportunity to spend a weekend on the farm and I didn’t want to leave. At that point I was already spinning my own yarn and I’ve always had a love of animals. So I thought about it for about a week or two and just took the leap of faith. It was a crazy leap but I am so happy I did! I did everything on the farm from feeding and taking care of the animals to running the farm’s fiber business. 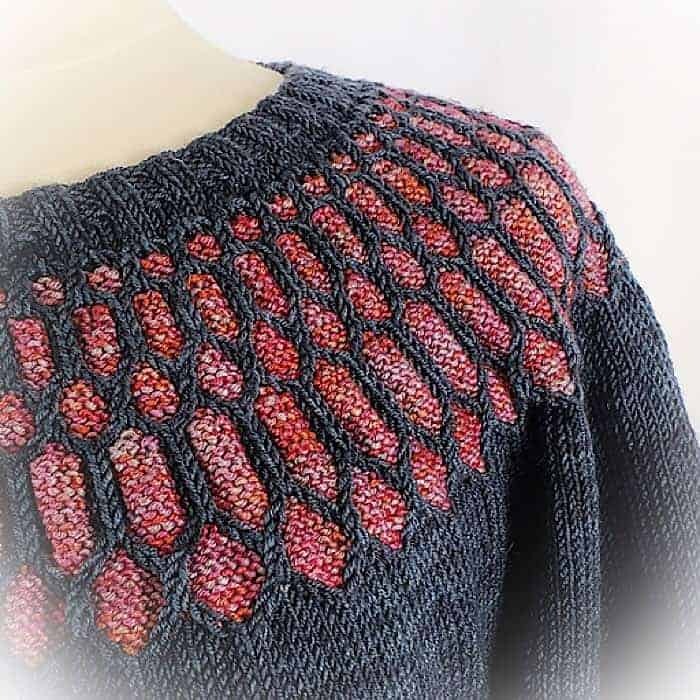 I loved it all and it taught me so much about how to run Queen Bee Fibers. 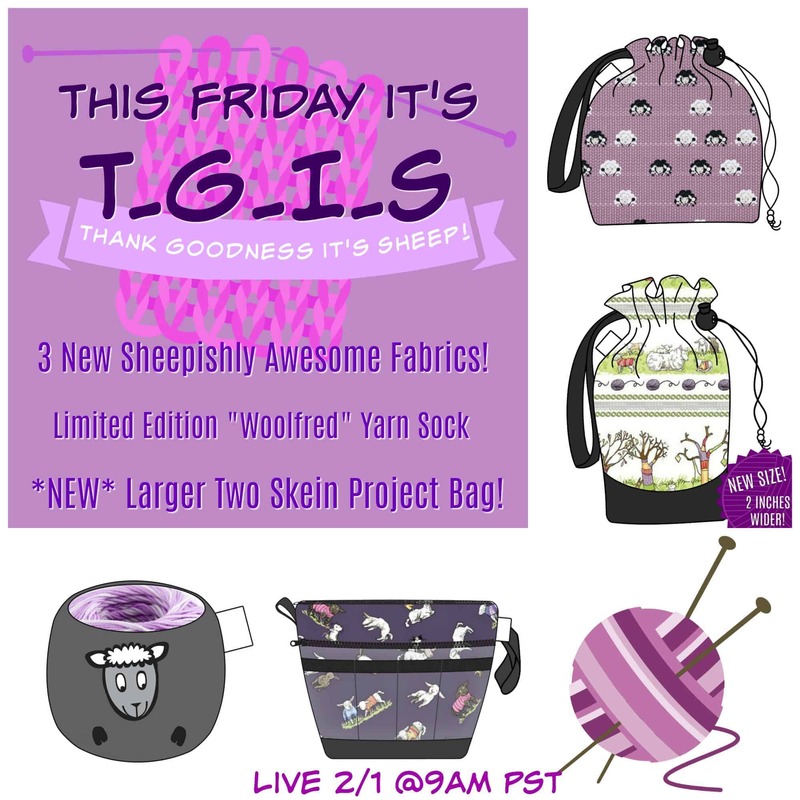 When did you decide to start Queen Bee Fibers? 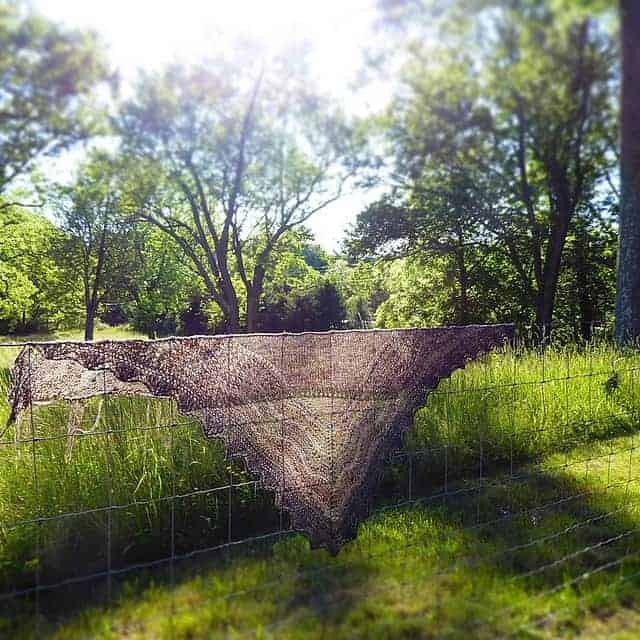 When I started at the farm I knew that one day I wanted my own farm and fiber arts business. I started Queen Bee Fibers around a year into working on the farm. 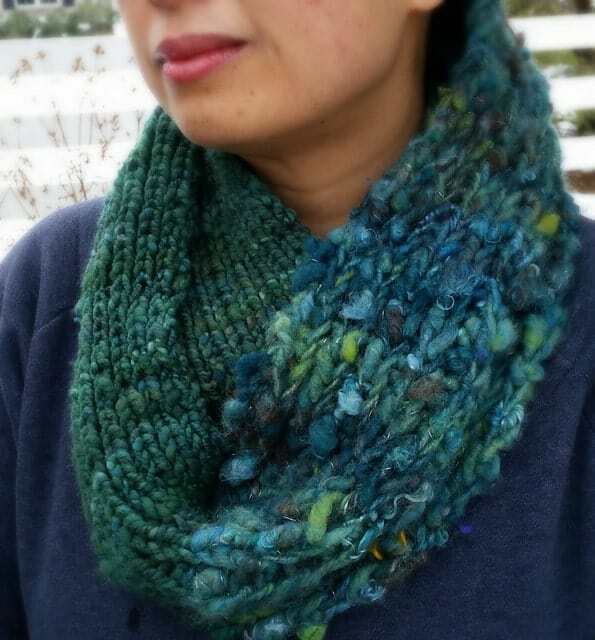 I started with just hand knit items and handspun yarns. Then we got the bees and added our bath and beauty products to the line. 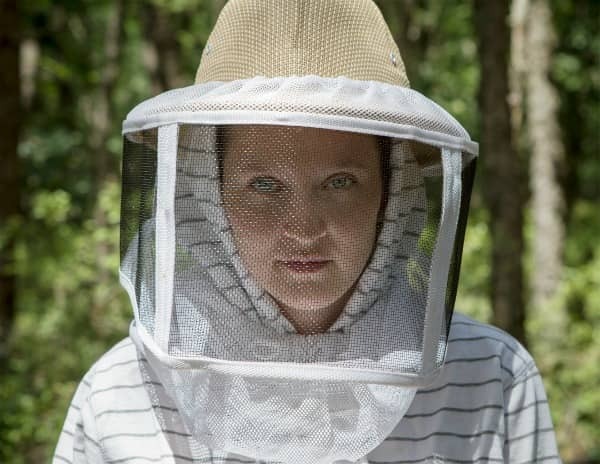 What does being a beekeeper entail? Nick (my husband) and I saw the movie “Queen of the Sun” and he told me he wanted to keep bees so we did just that. It was his dream at first but then I just fell in love as well. There is nothing better then the smell of the beehive or just sitting and watching them get to work. They are such amazing creatures and we could learn so much from them. About every 10 days we do a hive inspection to make sure everything looks good and healthy. If the hive is getting too packed we will expand the hive to give the bees more room. There is not much you have to do; they do most of the work. Then depending on how much honey is in the hive we will harvest it a couple times a year (leaving a good amount for them). Harvesting is a group effort. We do a very limited processing. We scrape the comb and honey off the frames into mesh bags and let the honey filter through into jars. With the left over wax we boil it down to clean it and then put it into our wonderful products like our Bee & Ewe Healing Honey Lotion. You create a lot of very soft, pastel colors. Are those the shades that you’re drawn to? In the beginning I tried to dye deep, saturated colors but they never come out right so I have learned that my dye pots like pastels so I just go with it. 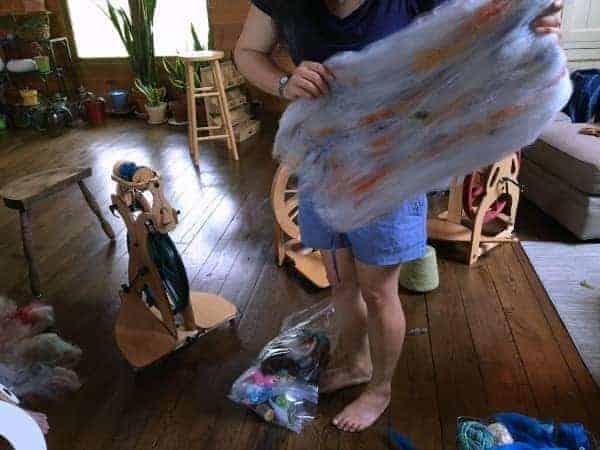 I also love spinning natural non-dyed fiber and mixing the two together. 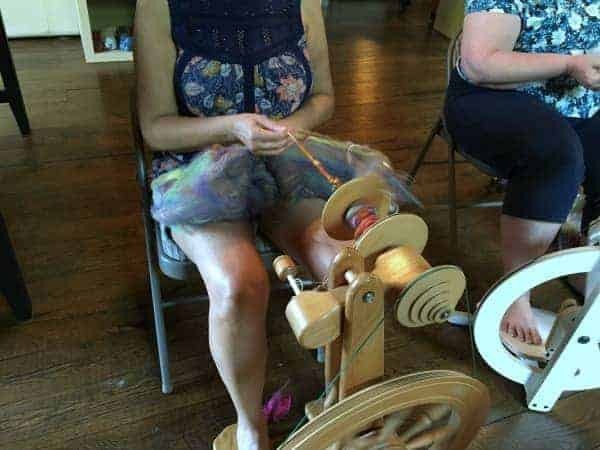 What would you say you do more of: knitting or spinning? I do them both equally. 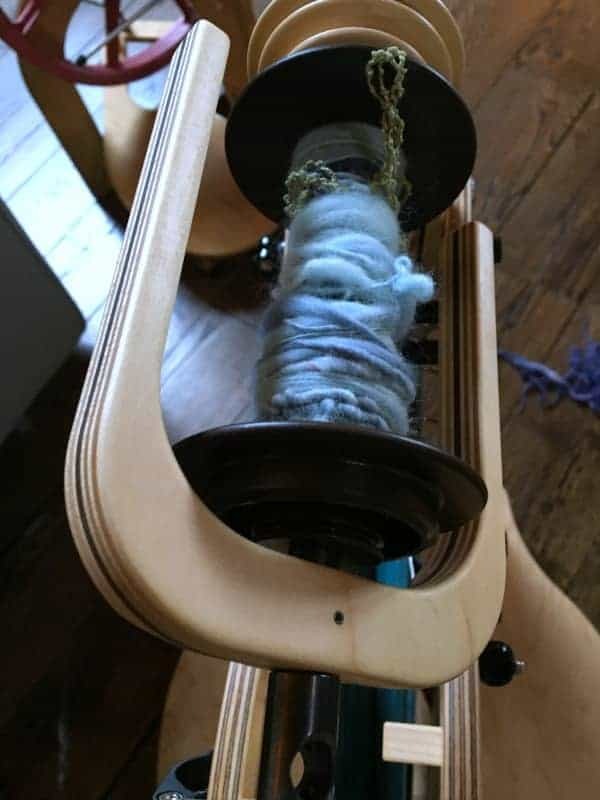 Sometimes I will just want to do one versus the other but generally I enjoy spinning more because I find it more relaxing. It’s my Zen. 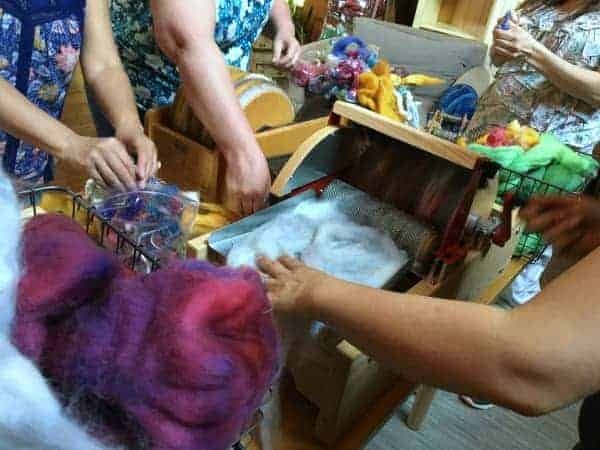 What have you learned running your fiber business? To always put love and passion into what you do or it’s not worth doing it. Running a business is tough. There are no vacation or sick days, but if you love what you do then it makes it all worth it. Follow your passion and everything will fall into place after you! Lexi modeling her own design, the Speed Bump Scarf. Can you explain a little more about what the Master Spinner class is and what you hope to get from it? The Master Spinner class is a six-year course that is taught through Olds College in Alberta, Canada. There is a week of in-class instruction and then a year of independent study. I am taking level one in Alberta, Canada June 23 to June 27. I decided to take two levels in one year. I am taking level two July 28 to August 1 in Smithtown, Long Island. I wanted to do the Master Spinner program to expand my knowledge and become better at my craft. 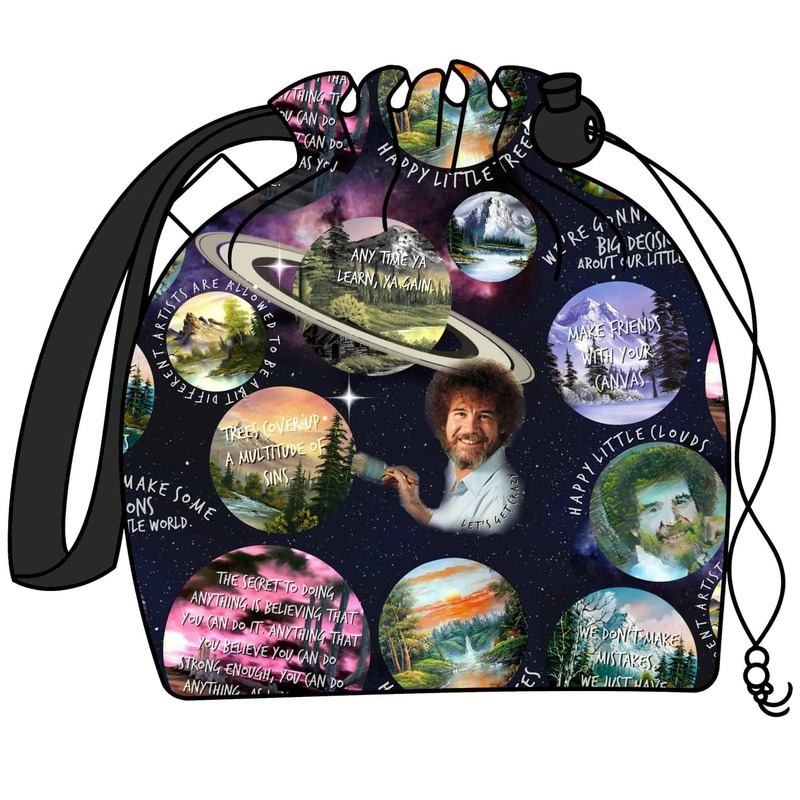 I also would love to teach so I believe this would make me a more knowledgeable teacher. 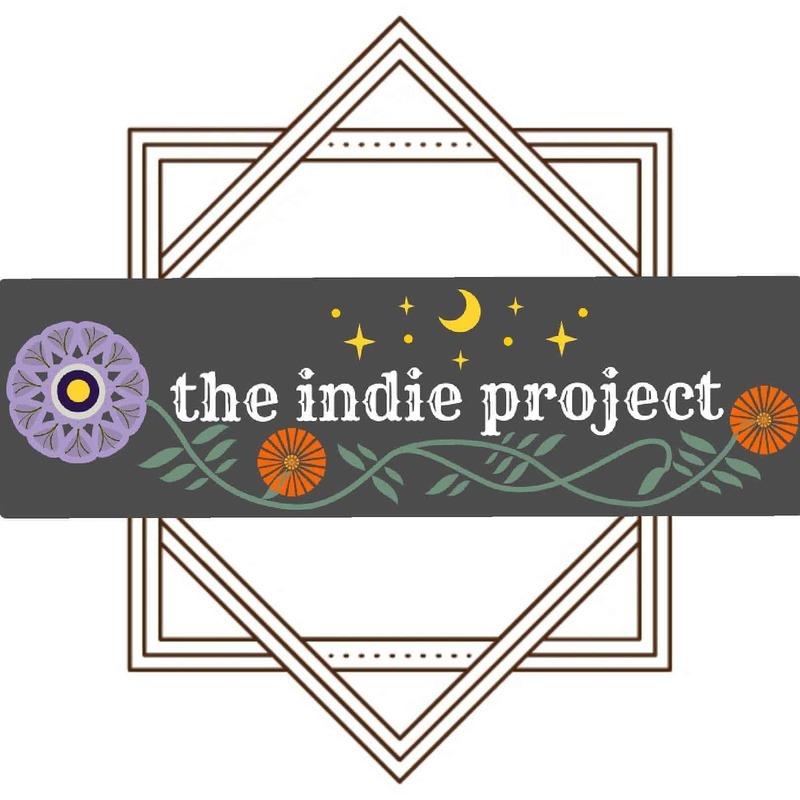 I am really excited about the process and will be blogging about my journey.